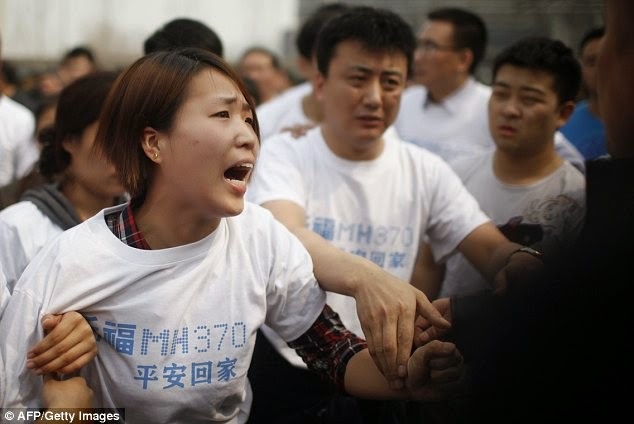 Relatives of the passengers killed on board missing flight MH370 today staged furious protests after receiving the news that there were no survivors on board the Malaysian Airlines plane. 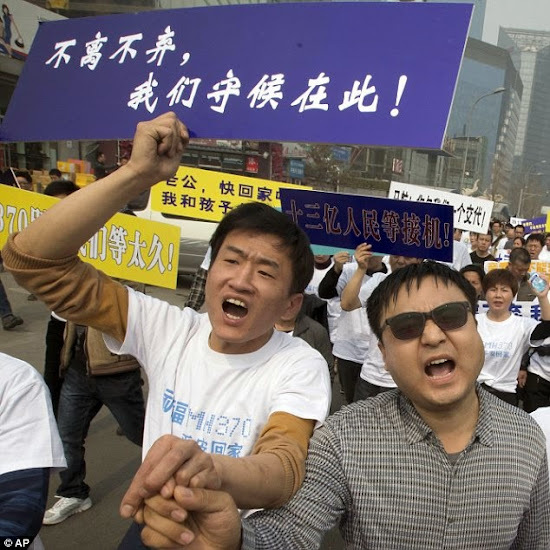 Chinese family members tried to storm the Malaysian embassy in Beijing as they expressed their fury at what they see as the bungled investigation into the flight's whereabouts. The chief executive of Malaysia Airlines today refused to say whether or not he would resign in the wake of the failure to find the flight, one day after a text was sent to the passengers' families informing them that the plane was almost certainly lost. But bad weather will delay the search for wreckage at least another day, as the Australian authorities suspended today's air and sea search operations due to adverse conditions. Malaysia Airlines Flight MH370 vanished from civilian radar screens less than an hour after take-off from Kuala Lumpur for Beijing with 239 people on board on March 8. No confirmed sighting of the plane has been made since, but debris has been found in remote waters off Australia which might be part of the missing plane. Officials in charge of the investigation are now working on the theory that the plane was deliberately crashed by one of the people on board, according to the Daily Telegraph. 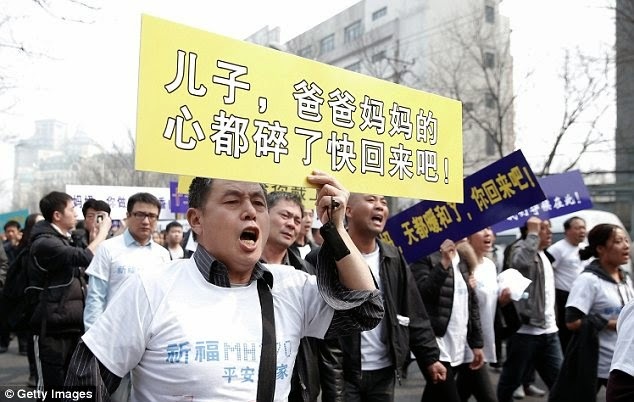 Dozens of relatives descended on Malaysia's embassy in Beijing to demonstrate their fury at the failure to find any hint of the wreckage in 17 days of searching. They chanted slogans including 'Return our relatives' and 'The Malaysian government are murderers', while fights broke out as security guards tried to stop the demonstrators from talking to reporters. Some protesters threw water bottles at the building and tried to storm the embassy as they demanded a meeting with the Malaysian ambassador. They held signs that said 'MH370, Don't let us wait too long!' and '1.3 billion people are waiting to greet the plane'. A group which claimed to represent passengers' families issued a statement describing the Malaysian airline, government and military as 'executioners'. The Chinese government apparently joined the outcry against Malaysia, demanding to know exactly why the country chose to declare yesterday that MH370 had been lost. Deputy foreign minister Xie Hangsheng told the Malaysian ambassador to hand over the satellite data used to conclude that the flight had crashed into the ocean. The brother of an American IBM executive who was on board the flight said his 'heart was hurting' after receiving the news that the plane had probably crashed. James Wood, whose brother Philip Wood was the only adult U.S. citizen on MH370, told BBC Radio 4's Today programme that he felt more evidence was needed before the flight's fate would be known for sure. 'As you may expect my heart was hurting pretty bad this morning,' he said. 'It has been a long two weeks that we have been waiting for some sort of answer. However, as the day grew on, the certainty with which the statement was made this morning was a bit clouded. However, despite the uncertainty he said that he did not believe he would ever see his brother again. ‘As hard as it is to say this, I am not holding out much hope,' Mr Wood said. ‘It has been a very anxious time. The first week was a bit numb then the second week things start to set in.